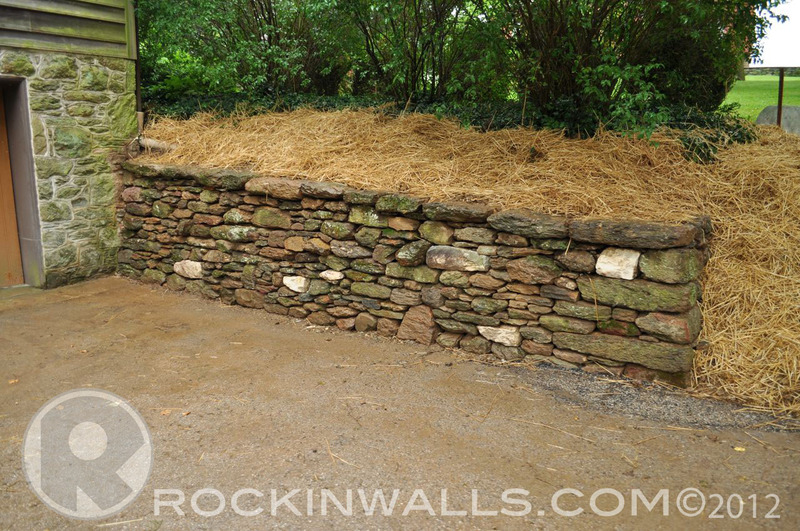 Dry Laid Retaining wall 19' x 4' left end/ 3' right end 3.5' average 1:6 Batter, protruding tie stones, large flat cap stones. With 90 degree corner 3 feet back into bank. Local stone from the property. In addition 6 field stone steps. Replacing original wall mortared failed due to water drain pipe installed improperly. 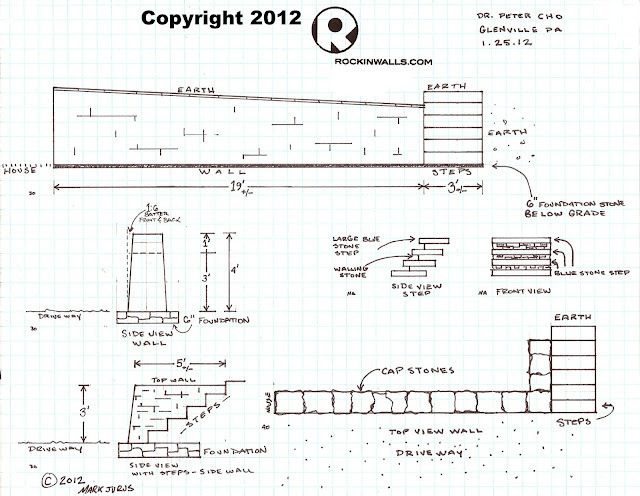 The wall most likely would still be standing if a contractor didn't make such a big mistake. 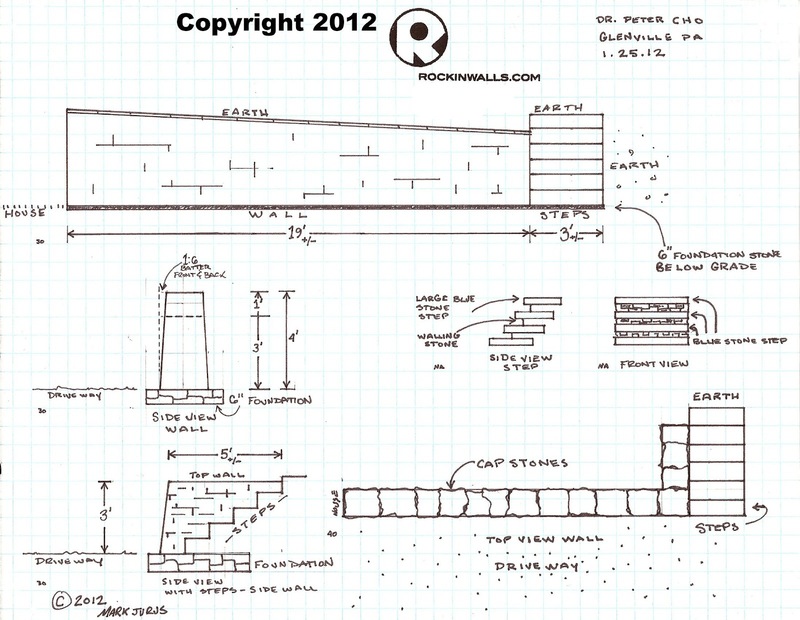 Read more on what might have caused the wall to fail. Blog - Mortar last for ever!? PART 2. 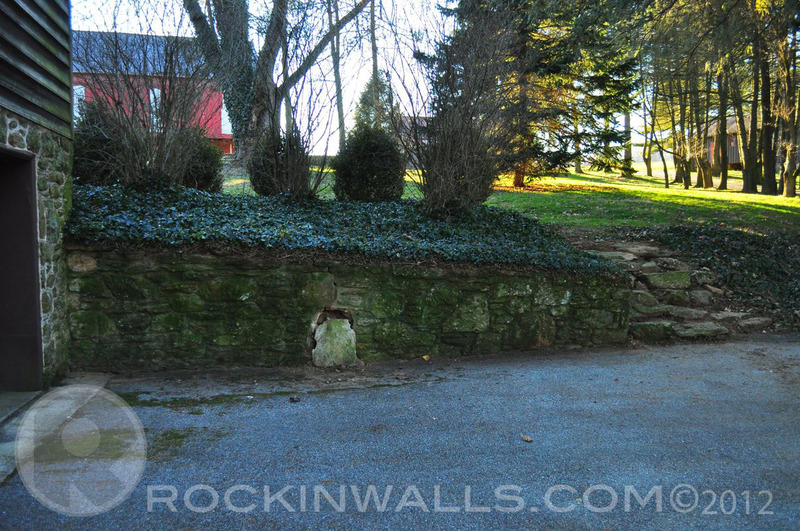 Wall was built in 1969. Since the wall was leaning due to hydraulic pressure ( water pushing on the back of the wall ) Wall also had some kind of steps at the end if you can call them that. 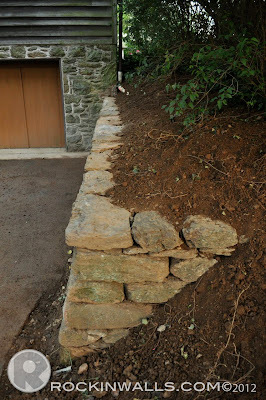 With the wall steps had been planned for if we had the right stones. 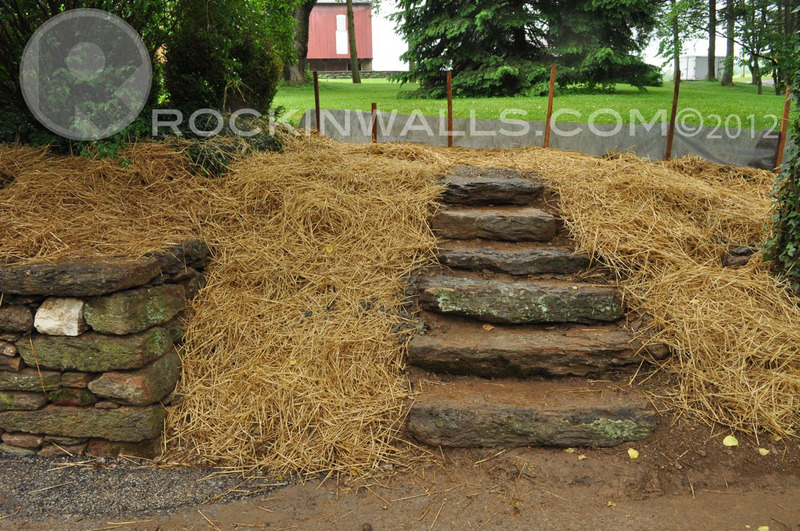 I was able to the client a nice set of steps to come from the front of the home to the back. The stones had also been set aside as I found large flat with a nice rise (height) and at least a 12" tread (width of step) Each step sits on the one above and simply sets on the earth. 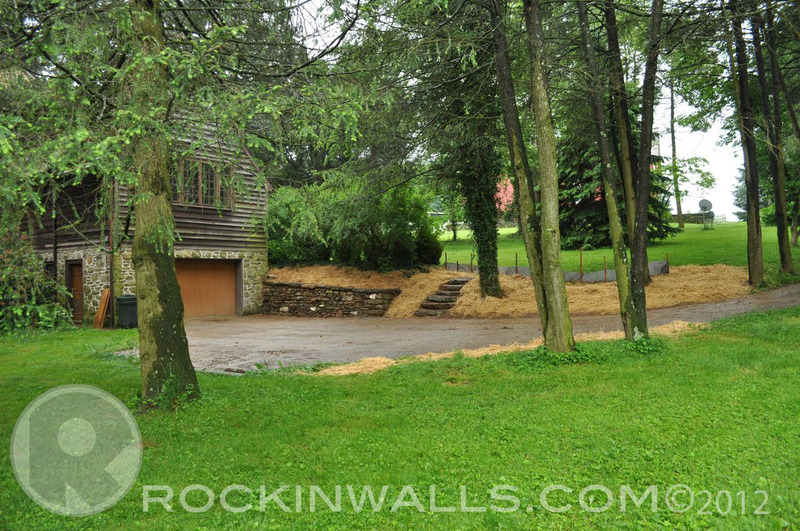 The 1813 historic home in Glenville PA called for a wall that fit the landscape. 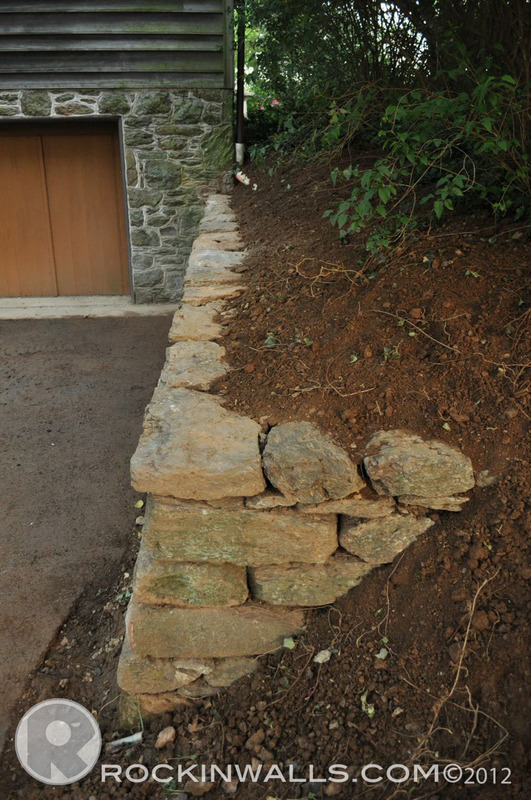 The clients had really taken the time to review all options both a new mortared wall or a dry laid stone retaining wall. They choose to go with my work and build dry laid. They also decided to use stone from the property. Using stone from the property would be the best historic match both to the home and date. To often I see homes with something over here and something over there - what I'm trying to say is projects done by different contractors or at different times and none of them took the time to think about the space. This would be like baking a cake with every thing in the fridge. IT JUST DOESN'T WORK! With the stone I had planned to gather stone from the many thrown stone walls in the fields. But when they had said I could use a corn crib foundation I didn't know I was sitting on a treasure. After spending a little time. I realized al the work was already done. 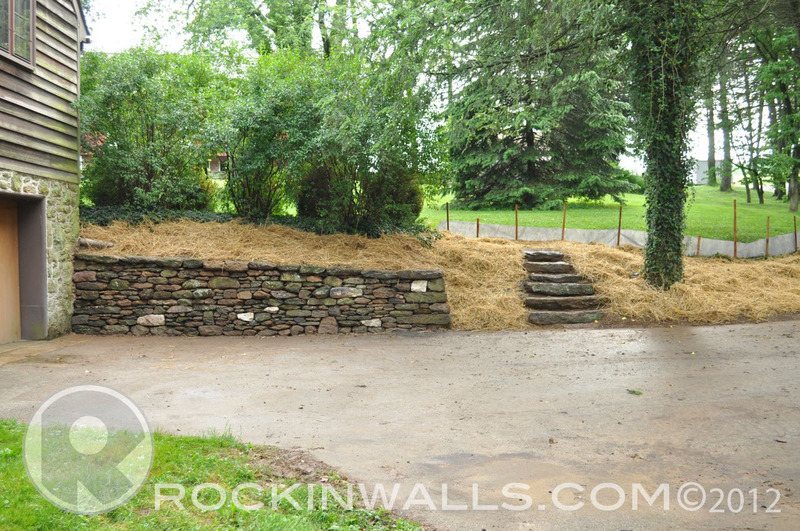 With a existing foundation someone had already take the time to find the best choose stones for the build. Protruding tie stones ( Blog - How To - Tie Rocks / Through - Stones) place center at every 3' and 22" above foundation. As you can see with the corner I had some really nice large stones for my dovetailing my corner helping to lock the corner. Corner built 3' back into bank but 3' high all the way. Earth hides the other part of the build. Project 13 days, including removal of old wall, gathering all stone from property, dry laid stone construction of replacement wall, steps, grading, excavating site, seeding, set up/clean up, removal of old stone from corn drib with basic grade of site. 3 days of building in the rain. You can't do that with mortar. 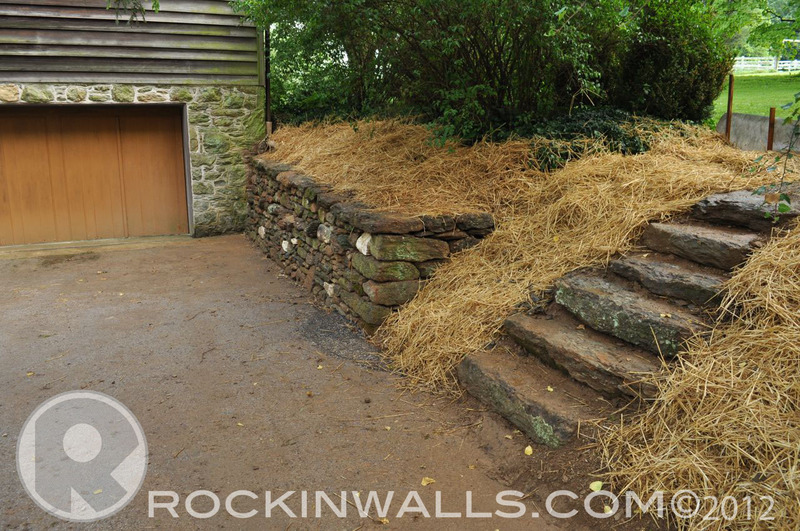 A wall that looks like it was build 100 years ago and fitting the landscape. 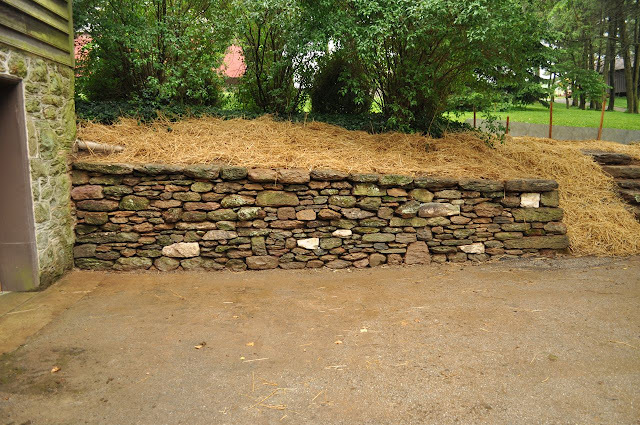 No fuss no mess - dry laid stone construction. NO wall to go to a land fill because mortar was used. At any time this wall can be removed or added too 100% GREEN. This is why love dry laid stone. Nice work Mark. I agree- this wall has just the right look here. 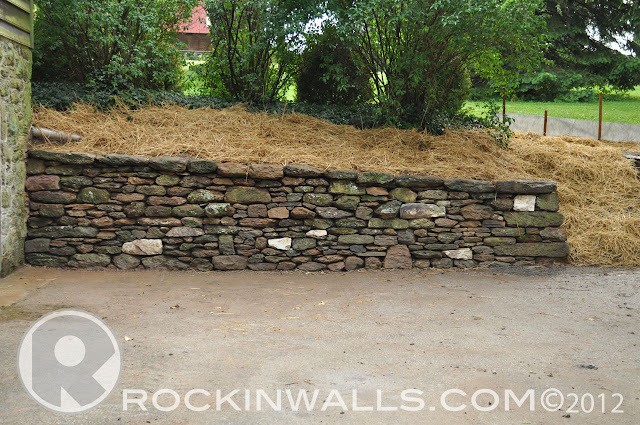 The local stone always rules the day and has the right "sense of place".